Reuse. Repurpose. Recycle. It’s what everyone’s talking about. Google searches now turn up hundreds of websites offering creative ways to jump on the bandwagon and ‘be green’. E-waste is a growing problem globally and continues to rise. Due to rapid developments and advancements in technology, there is an unfathomable amount of e-waste is created every minute. Used electronics which are destined for reuse, resale, salvage, recycling, or disposal are all e-waste. Less than 13% of e-waste is being recycled at this time. Recycling raw materials from end-of-life electronics is the most effective solution to the growing e-waste problem. They contain a variety of materials, including metals that can be recovered for future uses. Recycling and reusing these materials greatly reduces air and water pollution caused by hazardous disposal. Due to the recent rise in popularity of 3D printing, certain 3D printers have been designed to produce waste that can be easily recycled, which in turn decreases harmful pollutants in the atmosphere. Excess plastic from these printers can also be reused to create new 3D printed creations. Zero Waste is now the ultimate goal, guiding people and companies in a direction where all discarded materials are designed to become resources for others to use. The end goal – no trash to be sent to landfills or incinerators. Selling excess, surplus toner to a buyback company is also a good way to clear your office and save the environment. Companies such as Toshiba, Lexmark, Kyocera are literally paving the way to zero waste, putting innovative programs in place to show their commitment to the world’s e-waste problems. 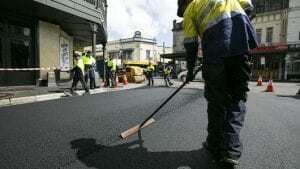 Working in partnership with high tech resource recovery company Close the Loop, Australian based Downer has introduced TonerPave, a new asphalt compound with enhanced performance properties due to the inclusion of recycled polymers and other additives. The polymers used are post-consumer recycled polymers sourced from recycled toner cartridges, waste acrylic paint and/or rubber crumb from recycled car and truck tires. But the magic behind TonerPave is MTP (Modified Toner Polymer), which is made from post-consumer recycled toner powder. A good toner buyback program can turn your extra toner and left over ink cartridges into cash. The toner powder used to make MTP has been sourced from cartridges collected and recycled by Close the Loop on behalf of the companies they represent. Close the Loop has collected and recycled over 22,000 tons of toner and ink jet cartridges over the past 17 years since their inception, and the streets of Sydney are busy paving the way towards zero waste. Perhaps an unexpected but welcomed benefit of TonerPave – the city estimates that the toner asphalt reduces emissions by 40 percent compared to conventional asphalt.